In the last 50 years, we have generated more knowledge than in the past 50,000. Since 2010, the pace of change has continued unabated, requiring constant learning and intelligent responses by organisations to shifting and evolving employee, customer, shareholder, and stakeholder expectations. Competition for knowledge and our ability to share and co-create it in real time is essential for re-generation and re-invention. 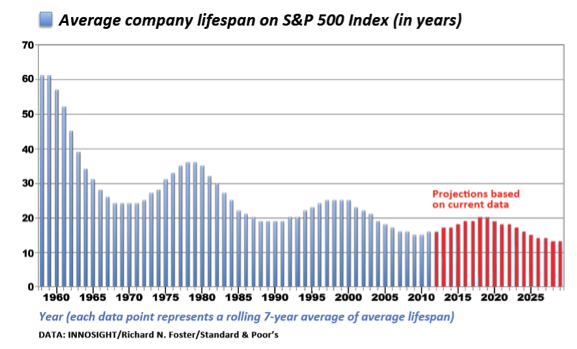 As the graph below illustrates, the lifespan of business is shortening, and the same principle applies to work teams and personal careers. Without agility, we will find ourselves stuck in a position which the world no longer wants. Consequently, leadership agility and the organizational agility it creates, is vitally important for delivering sustainable success. Leadership by itself is generally considered ‘to be like beauty; it’s hard to define but you know it when you see it’. The importance of this quote is leadership is both exhibited by the leader/s and perceived by the follower/s. Leadership comprises a context specific, two-way, social influence ‘happening’ between people, which consequently has impact on the perception of what is viewed as most important during change within the organisation, and throughout the external relationships with customers, shareholders, suppliers and other stakeholders, including the community within which the business operates. In this sense all these parties are the customers of the leadership which they receive. Without a high quantity of quality communications and relationships, there will be insufficient knowledge exchange to ensure individual, team and organisational viability, i.e. there will be insufficient agility to respond effectively to any change. Leaders shape followers perceptions and expectations through how they practice leadership. In this way the ‘leader’ addresses the key question, ‘why should anyone be led by me?’ Likewise, followers need to learn how to support the emergence of leadership through their own followership, and by doing so they also learn more about their own leadership. In any situation there is no leadership present if followership does not exist, regardless of job titles. In fact, leadership seen only as a product of status or position in the hierarchy often gets in the way of front line ‘agile’ responses to the emerging market and customer propositions and demands.